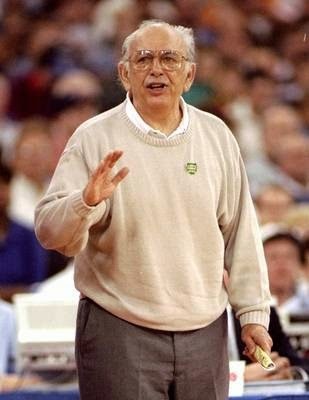 I am a fan of Pete Carril's Princeton Offense. What I like about the Princeton Offense is its spacing, constant motion, flare screens and screens away from the ball, all elements that I try to incorporate into Team Hurricane's motion offense. Of course, its hallmark is the back-door cut for lay-ups, as well as the hitting open 3-point shots. "We pass, we cut, we shoot the ball well and we look for good shots. The main thing is to get a good shot every time down the floor. If that's old fashioned, then I'm guilty." "I don't recruit players who are nasty to their parents. I look for players who realize the world doesn't revolve around them." The strength of the offense is about being unselfish and the fact that everyone touches the ball. You can tweak the offense as much as you want to tweak it, but it helps everyone succeed. It has a lot of movement and even if one player is scoring, the other four players play a huge role in helping that process. My motion offense is basically a 3 out 2 in, and I love the symmetry that this set affords me. But the basic set for the Princeton offense can be 4-out with 1-in (either at the high post, or low post), a 2-3 high set, or a 1-2-2 (5-out) set. To run an effective Princeton Offense, a smart post player with good passing skills is key. It also requires players with a high basketball IQ and good perimeter skills... passing, dribbling, shooting, cutting, etc. While I embrace the concepts of the Princeton Offense, I do realize it may be difficult for youth teams to run when you have limited practice time.And like any good offensive system, there are certain concepts that you can incorporate into the offense that you run. Look at the Terrific Twenty and see what applies to the offense you run. 1) If you can pass, dribble, and shoot well, you will always dictate to the defense what they do. If you can't and are not fundamentally sound, they will dictate what you do. 2) You must always see and think on the court, in that order. 3) Don't ever become stationary(stop moving) for more than one second, even if you have the ball, unless you are in the post. Think continuous movement. 4) If overplayed by a defender, don't wait to burn him- go backdoor immediately. 5) If defense is playing you inside, go outside. If the defense is playing you outside, go inside. 6) Hard cuts to the middle will open up the perimeter - cut with conviction!! 7) Make sure you look at the ball when you cut -- be ready for a pass. 8) If you cut through and don't receive the ball, get outside to the perimeter as quickly as possible. 10) The purpose of the dribble is to get a defender out of position, so dribble with a purpose and in one direction. 11) If you are dribbled at by a teammate, look to go backdoor if played tightly. 12) Be ready to roll back or to the basket on all screens -- go opposite of wherever the cutter goes. 13) Keep good spacing (15-18 feet). 14) If you see there is weak-side help on defense, look to skip opposite and make them pay. 15) Don't go to the ball when closely guarded--go backdoor. 16) With few exceptions, cutters should go opposite of where they came from when going through. 17) Lay-ups and three pointers are what we want to get, in that order. 18) It doesn't matter who scores, as long as someone does. 19) Shots are missed because they are bad shots or the shooter doesn't think they can make them - take good shots! ￼20) Work hard to make things easy. Here are some old clips of the way the Sacramento Kings ran the Princeton Offense. At the time Sacramento ran this offense, Pete Carril was an assistant coach under Rick Adelman I'm a big fan of the corner cut after a pass to the pinch post as a way to initiate a variety of actions. Here is the college level Princeton Offense being run, Post-Carril, but still incorporates the key elements of constant motion and a spread offense, screening, etc. Whether on the Pro Level or College Level, the unselfishness of the Princeton Offense can not be denied. Some will say it's old school basketball, but being unselfish, wanting to see your fellow man succeed, and willingly play a part in another's success, is a life concept that NEVER goes out of style.